RBTH presents a selection of views from leading Russian media on international events, featuring reaction to Ukrainian President Petro Poroshenko’s call for the deployment of EU peacekeepers in eastern Ukraine, as well as reports on the supplies of Russian gas to the Donetsk and Lugansk ‘people’s republics’ in the region and a Jordan-drafted UN resolution calling for the weapons embargo on Libya to be lifted. The RBK newspaper reports that the representatives of the self-proclaimed Donetsk and Lugansk people's republics (DNR and LNR) in the Donbass region of eastern Ukraine, as well as Russian politicians, have spoken out against sending an international peacekeeping mission to the conflict zone in Ukraine. These proposals were made after Ukraine's National Security Council met with the Defense Ministry. Ukrainian President Petro Poroshenko announced that the best solution for Ukraine would be an "EU police mission." According to RBK, the Minsk Agreements, which were renewed last week, did not include the participation of a peacekeeping contingent. All the authority for monitoring the ceasefire and assisting the withdrawal of heavy weaponry was placed on the Organization for Security and Cooperation in Europe (OSCE). However, the organization's representatives have said on numerous occasions that they do not have enough resources to operate in all the areas of the conflict. 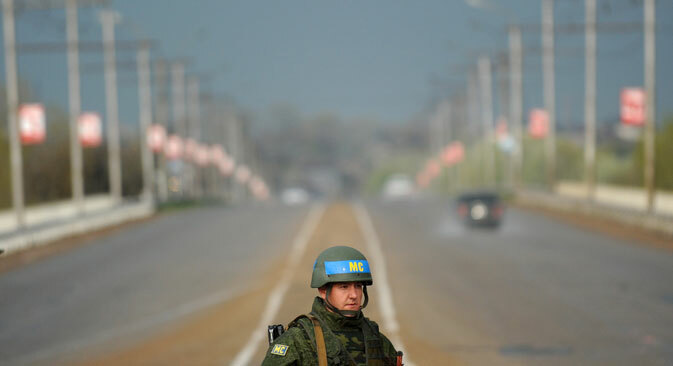 During the escalation of violence as rebels attacked the strategic town of Debaltsevo the organization’s representatives said that they had not been able to enter the town. The formation of any peacekeeping mission would have to be approved by a UN Security Council resolution, in which Russia would have the power of veto. "In the current conditions Russia would not agree to such a resolution," RBK cites Russian political analyst Alexei Makarkin as saying. The Kommersant business daily writes that the self-proclaimed DNR and LNR republics have been able to obtain direct gas supplies from Russia. The agreements were made less than a day after the republics announced the cease of gas supplies from Ukraine - Moscow immediately expressed its desire to provide "humanitarian aid on a commercial basis." Gazprom announced officially that supplies to the Donbass had begun and would continue within the framework of a contract with Ukraine’s state oil company Naftogaz, meaning that Kiev would be paying the bill, adds Kommersant. Kiev explained that the stoppage was due to damaged pipelines that could not be repaired prior to the end of the battles. But all interferences were immediately removed after Gazprom confirmed the beginning of supplies. A Kommersant source from Naftogaz said that the DPR and LPR had made clear their plans to use Russian gas a long time ago, in order not to depend on Ukraine. A new conflict has thus arisen in Russian-Ukrainian gas relations. Kommersant believes that Gazprom has now increased its chances of facing U.S. sanctions. Up until now the gas giant has been avoiding direct contact with participants of the conflict in Ukraine - in particular, by not purchasing the Crimean oil and gas company Chernomorneftegaz. According to Yulia Galuyeva, director of the legal department of the National Juridical Service, in such a situation it cannot be excluded that the U.S. will consider Gazprom's supplies to the self-proclaimed republics as interference in Ukraine's internal political affairs. The centrist daily Nezavisimaya Gazeta reports that Jordan has submitted a draft resolution to the UN Security Council with the aim of lifting the weapons embargo imposed on Libya's official government and thereby helping it fight the Islamic State of Iraq and the Levant (ISIS) radical militant group. Such organized activity will not only help defeat the jihadists but will also establish a monocracy and regulate the political crisis in the country, which has seen only chaos after the fall of Muammar Gaddafi. Most Arab countries are lobbying for the measure, but the UN is afraid that it may lead to a new stage in Libya’s civil war. Nezavisimaya Gazeta cites Oleg Bulayev, scientific collaborator at the Center of Arab and Islamic Studies at the RAS Middle East Institute, as saying that "the practically uncontrollable territories in eastern Libya have become a sort of platform for training militants who can be dangerous for Egypt." Russia's Permanent Representative to the UN Vitaly Churkin has said that Jordan has presented a serious resolution and an important initiative. He also did not exclude the possibility of Russia participating in the operations against ISIS.